The new Ezee MultiBlock is a multi image photo block available in either a four or nine tiled image layout. 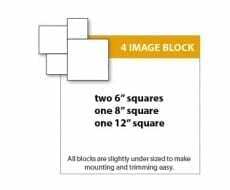 The face of the black edged 9mm MDF blocks are pre coated with a pressure sensitive adhesive film allowing prints or photographs to be easily mounted by hand. The backs of the blocks are also pre coated so they can be mounted to the ready-to-hang backing template giving you the perfect result.